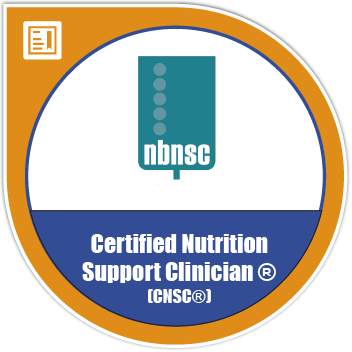 Earners of the CNSC® credential are dietitians, nurses, pharmacists, physician assistants, and physicians who have attained the skills and knowledge necessary to provide quality nutrition support care. Certified professionals are recognized as quality providers of nutrition support by the public, their colleagues, other members of the healthcare team and administrators. Individuals are registered dietitians; registered nurses including nurse practitioners; licensed physicians (MD or DO); licensed pharmacists; licensed physician assistants. Recommendation is at least two years of experience in nutrition support prior to taking the exam. Submit an application and supporting documentation for the CNSC exam. Successfully pass the CNSC exam. International candidates must meet additional criteria.